There is an old Sesame Street song that will forever remain in my memory: “One of these things is not like the other.” The song is usually accompanied by several items that are the same and one different. We have been commenting for several months now about the growing divergence between corporate high yield bonds and equities. In short, while equities have benefited from the record amount of stimulus provided through the Fed’s Quantitative Easing program, corporate credit has not. As credit tends to be a better leading indicator of the economy then equities, this represents a significant warning sign. The chart below highlights the dramatic difference in how corporate credits responded to QE I compared to QE II. In March of 2009 the financial world was priced for Armageddon. Yields on corporate high yield bonds were near 18% and the S&P 500 was 670. QE I was announced and asset prices responded accordingly, reflecting a temporary end to the economic free fall. Not the case with QE II. 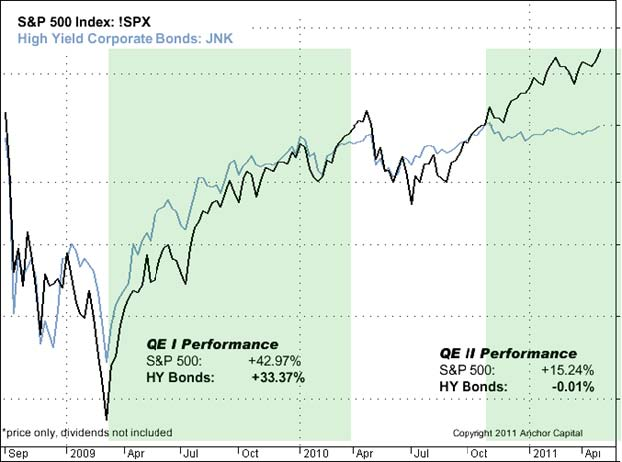 Since embarking on QE II the S&P 500 advanced +15.2% into the end of April, while prices of high yield corporate bonds actually declined marginally. We have seen this movie before. This type of divergence is typical of a major market topping process, and with yields near 6.5%, high yield bonds are poised for declines. The climate is eerily similar to the summer of 2007 when like now, there was very little respect for risk. While equity prices have rallied, the past two quarters have offered increased volatility and little trend either up or down in corporate high yield bonds. We consider this a strong warning. The Federal Reserve withdrew the QE I treasury purchase program in April of 2010. By August the S&P 500 declined more than -15%. The June 30th end of QE II is now weeks away. Of course it would be foolish to assume history will repeat exactly, but without the support of the liquidity provided by QE II and valuations and yields at rich levels, the climate is ripe for harsh market volatility and falling prices. As of the time of this writing in the first week of June, markets are continuing to fall erasing most equity index gains for the year in less than 10 trading days. With current yields near all time lows, we expect there may be more substantial selling in corporate bonds and equities in order to reset values and re-price risk.